May Craft Challenge – incorporate a picture frame into the challenge. 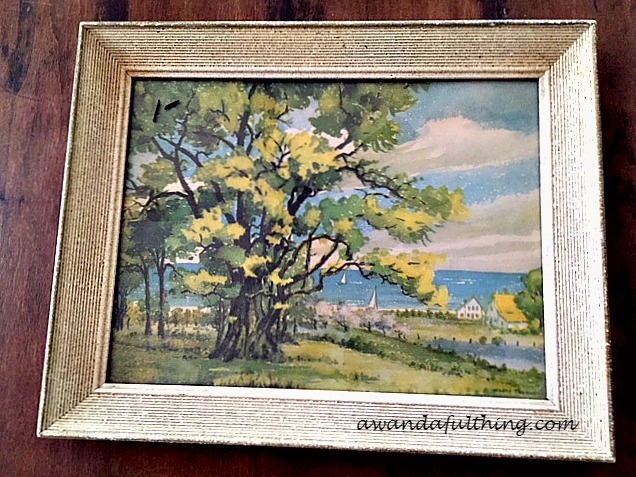 As soon as I saw the framed print at one of my favorite thrift stores, I knew I was going to buy it specifically for the frame (even before I knew that May’s craft challenge involved a picture frame). This challenge cost me $1.00 – yes you read that right one whole dollar and the reason why is that I already had the rest of the supplies in my craft stash. Check out the price tag in the upper left hand corner of the before picture?I used the cream-colored craft paint I had leftover from another project and painted the frame with two coats of paint. Once it was dry, I replaced the picture with a pretty pink patterned piece of scrapbook paper. I wanted something light so that I could write on the glass and you could still be able to read it. 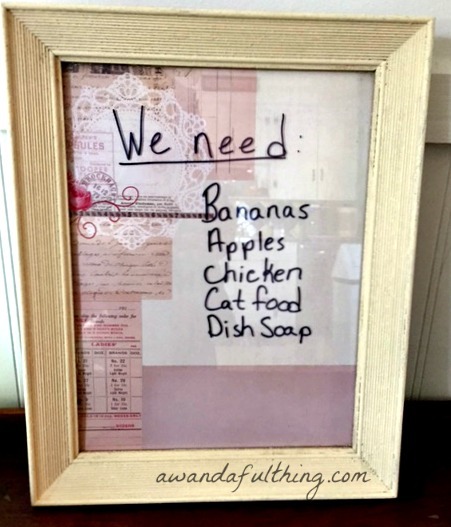 I wrote my list on the glass with a permanent black marker and then thought oh oh I hope it comes off – it didn’t, not with tap water but then I used nail polish remover (with acetone) it rubbed off no problem – Whew! I think this has potential to be a ‘”To Do” list for my office or I might add handles, change out the paper and use it as a serving tray on the patio. My friend and fellow blogger Amelia – she blogs at You Can Always Start Now received some lovely valentine cards in the mail in February and held onto them because she said they made her happy. 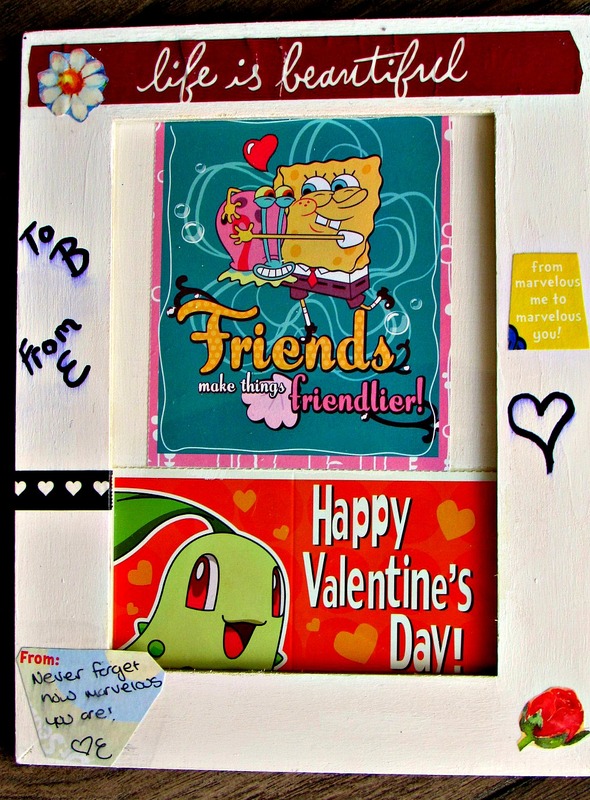 When this challenge came along she decided she would frame them and went a little further and decorated the frame too! It is wonderful to use the things you already have to make or decorate your space. We had fun doing this challenge looking forward to what next month brings. Be sure to Mark Your Calendar for June as we will be crafting using an embroidery hoop. This entry was posted in DIY, Make and tagged antique, challenge, Challenges, cheap, Crafts, creativity, Decorate, DIY, easy, grocery list, ideas, inexpensive, one dollar, paper, recycle, repurpose, reuse, romantic, scrapbooking, simple, thrift, thrift store, to do. Bookmark the permalink.